Hey, I'm Phil, I'm 25 and have been drumming since I was 6 - my dad was a professional drummer for 25 years and taught me everything I know. 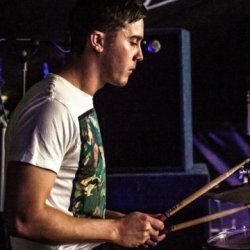 I have wanted to pass on my knowledge and experience for some time, and made the decision to become a drum teacher so I could encourage the same passion for drumming in others. I teach from home, in a light and airy conservatory, with an Allesis Strike Pro electric kit. There are also comfortable seats in the conservatory for parents to sit in on lessons. I have taught adults and children at a beginners level, and tend to break down the beats in a simple and understandable way. I go at the pace of the student but at the same time I try to see where a learner can be pushed further, and challenged to achieve their targets. Each lesson, goals and targets will be set for learners to work on between lessons, and this will all be written down for them to take away. I have a laid-back approach, and don't put too much pressure on. It is up to the student to commit to making progress, and I will help facilitate this, and also bring challenge where needed and wanted. My role is very much one of bringing the knowledge and the techniques needed to become a skilled drummer, and being a voice of encouragement when it gets hard.